Do you think you have what it takes to become the next Business Man or Woman? Have you got the skills, the tricks and the passion? Above all, Are you a Risk Taker? If yes, then here is the opportunity you have been waiting for. 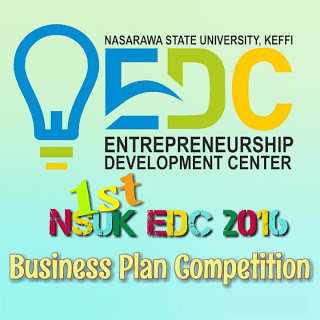 The NSUK EDC 2016 Business Plan Competition is here to help you actualize your dreams. Learn how to start your own business from scratch. Get trained on Ideas Generation, Business Plan Design, Web Access, Investors Attraction & many more. *10 Laptops for 10 Finalists. *Low Interest Loans For 10 Finalists. *A 1 year all expense paid Entrepreneurship Program for 10 Female Finalists. Registration Opens From 6th June - 31st July, 2016. Visit the Entrepreneurship Development Centre (EDC), Nasarawa State University, Keffi (NSUK),Nigeria.